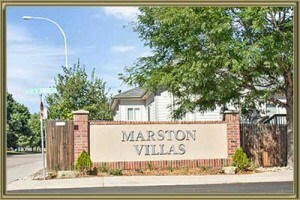 Marston Villas Condos are located in Littleton near the intersection of S Wadsworth Way & S Balsam Way. The condos were built between 2001 and 2003 by Falcon Homes. Each unit has 1-3 bedrooms, 1100-1300 square feet, central air conditioning, and either a reserved parking space or 1 car detached garage. The condos in Marston Villas are professionally managed by the Mile High Management Group. The monthly HOA fee provides exterior and grounds maintenance, plus sewer, water, snow and trash removal. The complex has a community pool, fitness center, and clubhouse for residents to use. The condos are fabulously located near shopping, transportation, restaurants and so much more! Contact our Littleton real estate agent to schedule your tour of Marston Villas today. See what your Condo is worth With an Instant Home Valuation Online. Want advice on selling your Condo? We provide a free staging consultation, pre-listing prep plan, and a Marston Villas real estate market analysis. Call us at 303-325-5690 to learn more. New to the Area? Call our Marston Villas real estate agent at 303-325-5690 to schedule your tour of Condos in Littleton CO.